To improve the performance of searches within a table, you can set a field to be indexed. Indices allow TrackVia to more efficiently search through large sets of data. You can set up to 5 fields within a table to be indexed. We highly recommend using this setting if you only need to search up to 5 specific fields in your table. Step 3: Save your choices! 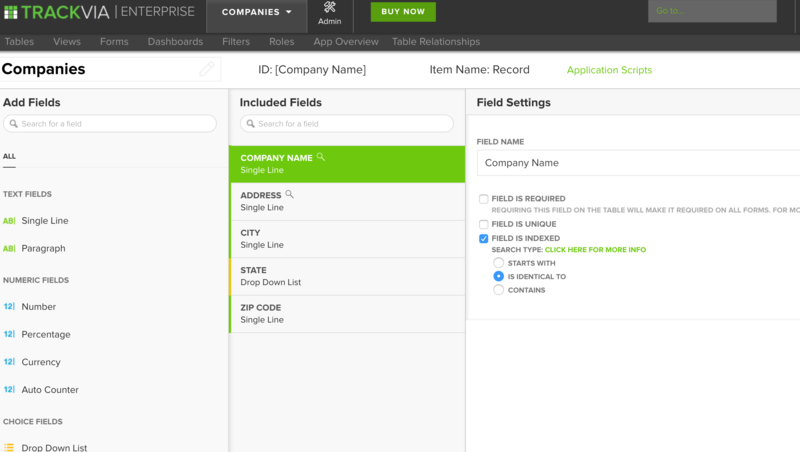 Note: If you choose to index a field, TrackVia will no longer search ALL fields in the table. It will ONLY search the fields that have been indexed. This would only affect search via the search bar. Quick filters will still be able to filter based on any field within the table. We recommend utilizing Quick Filters to search fields if Table Level Indexing is not utilized.